With current and past college and university Presidents on hand, as well as past and present Cowley College Board members and many local and state dignitaries, Dr. Dennis Rittle was sworn in as Cowley College’s fifth President during a presidential installation ceremony held Sunday, November 15 inside the Robert Brown Theatre on the school’s main campus in Arkansas City. With close to 300 people in attendance, the formal swearing in was conducted by Cowley College Board Chair Dennis K. Shurtz. The event featured guest speakers Ray Frederick, Jr., Chairman of the Kansas Postsecondary Technical Education Authority, and Linda Fund, Executive Director of the Kansas Association of Community College Trustees (KACCT). The Reverend Christopher Clem also spoke at the event. “Their words were very humbling and touching,” Dr. Rittle said. Mr. Bill Docking, a member of the Kansas Board of Regents from 1995-2005 and a current Board member of the Cowley College Foundation, provided the welcome address. Mr. Edward Gilliland, a member of the College’s first Board of Trustees and the first president of the Cowley College Endowment Association (now Cowley College Foundation) provided the invocation. While, Dr. Nick Rogers, president of the Cowley College Foundation Board, led the benediction. Ms. Amy McWhirt, the College Education Association (CEA) President, presented Dr. Rittle with the Presidential mace, which symbolizes the Office of President of the Institution. The mace was cast by Ricky Squires, Machine Tool Instructor, and Cowley student Daniel Brooks. The walnut used in the mace came out of Maple Grove, a schoolhouse north of Winfield, KS. Dr. Harold Arnett, Cowley College Vice President of Academic Affairs, and Gloria Walker, Cowley College Vice President of Finance and Administration, were joined by Cowley College Department Chairs and the school’s Administrative Council in the processional. The American Legion Post 18 Color Guard were also on hand for the event, while special music was provided by the CC Singers and Ms. Marcia Wieland and accompanist Mr. Stephen Butler. Following the presidential installation a reception was held in the Earle N. Wright Community Room. 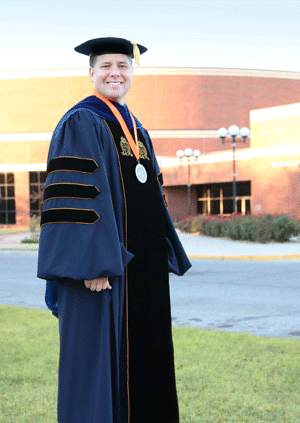 Dr. Rittle was overjoyed to be installed as Cowley College’s fifth President and happy his family and friends could share in the event. “This legitimizes me as the fifth president of Cowley College and moves it from a contractual relationship to a substantive relationship,” Dr. Rittle said.